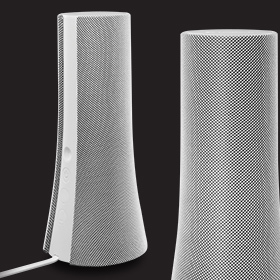 Rad said: Logitech’s Z600 wireless Bluetooth speakers have striking looks that you’ll probably either love or hate, and play loudly enough to satisfy anyone using happy with the limitations of desktop speakers. Offering transparent sound in a stylish package, they’re simple to hook up, and the price is on the moderate side. The gist: Cool little lifestyle stereo computer speakers.